We eat pretty well every meal at home, but sometimes it’s nice to take the kids out for a treat. 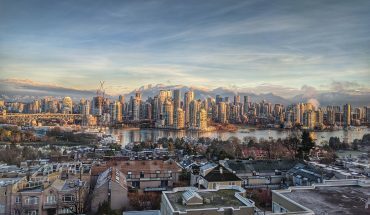 There are tons of well-known, and some lesser-known, treat haunts in Vancouver. But what’s worth its weight in sugar are those truly unique places that the kids will remember – not the big chain outfits. 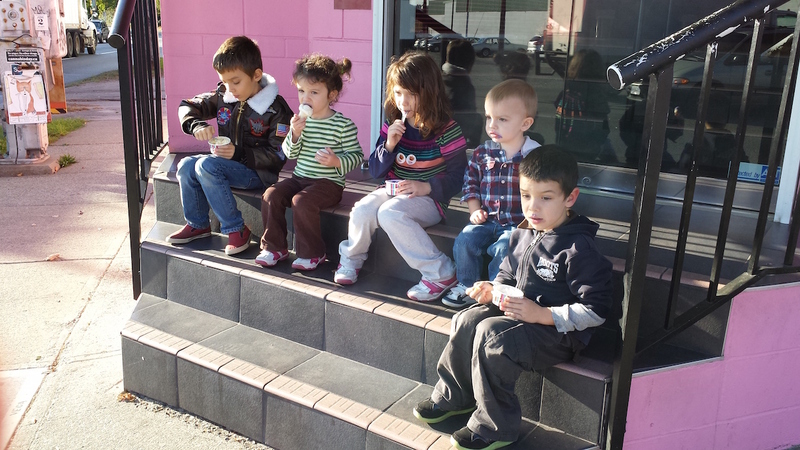 Here are just a few of our unique-to-Vancouver choices for feeding our kids’ sweet tooth. Our default seating at La Casa Gelato makes it difficult for others to enter. Sorry! With 218 flavours on-site, it’s tough to beat East Vancouver’s La Casa Gelato ice cream parlour for chilly treats on a hot day. The youngest can get a small kids cone (free! ), but I make a habit of buying at least 3 or 4 cones or cups to offset the freebie. Part of the whole experience is sampling, so try to go in when it’s not busy so the kids can run between counters, trying a few different flavours before settling on their choice. Of course there’s lot of the tastes you’d expect, but there’s some you wouldn’t too… like durian, wasabi, blue cheese, garlic and vinegar! 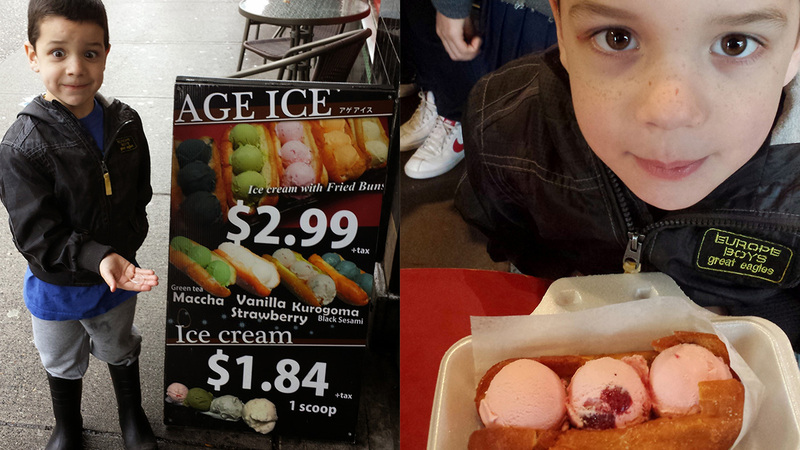 Shepherd’s giant baby seal eyes light up at the sight of the ice cream hot dog at Japadog. A Vancouver institution, Japadog is best known for its high end hot dogs sold from street carts and now a Robson street store. Celebrities such as Mark Zuckerberg have been known to frequent it. One day Shepherd and I headed out for a “treat walk” to see what unique eats we could find. This deep fried hot dog bun with three scoops of ice cream was amazing – and something that really should be split with one’s siblings, as we did on a later visit. The crunchy, sugar-coated bun coupled with ice cream scoops is a great combo. The deep friend Mars bar at The Templeton didn’t look this pristine for long. A classic, tiny diner on Granville street near Helmcken, The Templeton is good for all sorts of great eats, from brunch (always a big wait) to lunch or dinner. 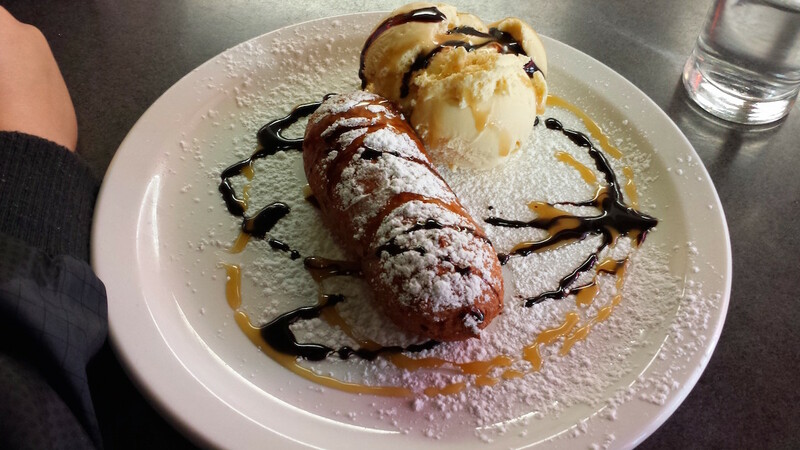 But among all the diner fare you can also find the Deep Fried Mars Bar. Invented in 1995 near Aberdeen, Scotland, this is a particularly heart-unhealthy treat that should only be deployed in extreme situations (i.e. when someone’s been a really good boy/girl). 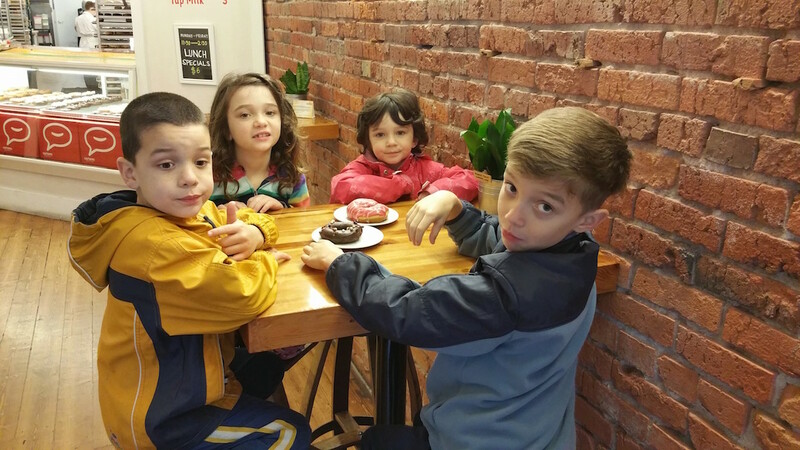 It was very difficult to get the kids to leave the donuts alone long enough for me to get this photo at Cartem’s Donuterie. Cartem’s Donuterie, along with Lucky’s Doughnuts, is one of the two most “cutting edge” boutique donut shops in town. 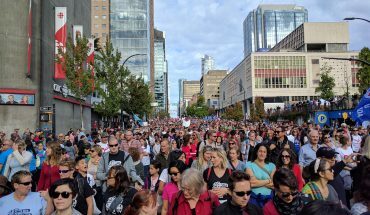 No doubt this trend is only just beginning. The kids love the crazy, colourful flavors and there are gluten-free and vegan options for Dad. [Note: I am not a vegan.] 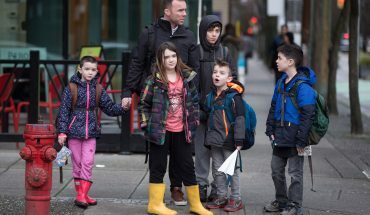 The donuts are a bit on the pricey side, but there’s no way each kid should get their own anyway, so split one between two kids and get a tall glass of milk to go with it. We popped by Cartem’s recently on our way to FlyOver Canada and the Vancouver Art Gallery (kids free on Sunday!). Indiana and Harlow dressed up – even doing make up – for their high tea at Neverland Tea Salon. As part of my eldest daughter’s most recent birthday weekend (yes, weekend), we took her to Neverland Tea Salon. 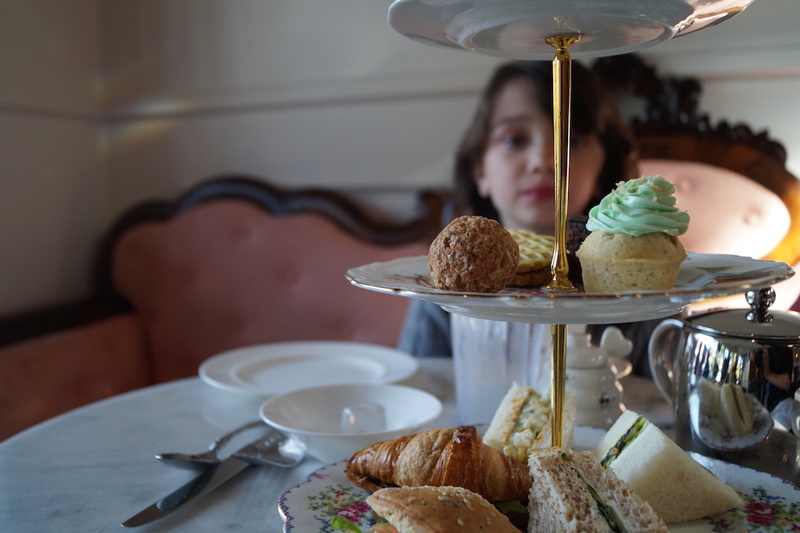 Located in Kitsilano, it’s a bit further out than our usual downtown destinations, but well worth it as they do a full high tea. If you’re so inclined, there’s even a gluten-free high tea option. The girls love getting dressed up and doing the full tea experience and the treats are royal-quality. Do you have your own local sweet treat go-to places? Let us know in the comments and we’ll go there next time!